From simple storefronts to iron rollercoasters, commercial new construction projects can look very different. Whether it’s the coverage variation between providers or the intricacies of the projects, the finer points of commercial builders risk insurance can be challenging to master. What types of projects are appropriate for commercial builders risk insurance? What considerations should be made when securing a commercial builders risk insurance policy? 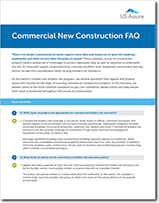 Complete the form to download our free resource and get help securing your client’s next commercial builders risk project.